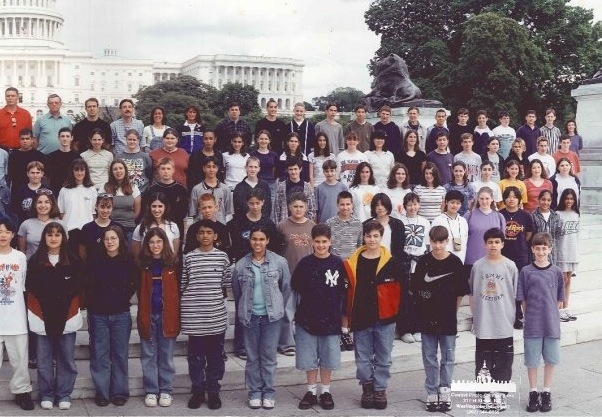 half a pic, half my 8th grade class on our trip to DC. Can you find me? This past weekend was my ten year high school reunion — a much anticipated event that I went back and forth with about attending. Why? Because I really didn’t know what to expect. Part of me was worried about awkward silences, old rivalries and unfinished business. Who was going to be there? How would everyone act? But what kind of blogger would I be if I missed out on the opportunity to report back on this pivotal event? And well, what if I missed a really good time? So I pushed my worries aside, got as dolled up as I am capable of doing, and headed down to the main event, and I’m really happy I went. I got to see so many people that I haven’t spoken to since high school. Sure, we are all connected on Facebook, but it’s really not the same as that real face to face time. Face to face we can relive old memories and reignite old relationships. With the benefit of hindsight and maturation, we can laugh at the silly things we did when we were younger. We can return to our roots and make connections with how we became the people we are today and see how far we have come. Some of the memories old friends shared with me were things I really didn’t expect to be remembered for. Everyone’s perspective is so different and when you are in the moment, you may not share how you are feeling or reacting to something with someone. The reunion was a chance to revisit those memories with the people we made them with, and make new connections. These are the people who knew me before 9/11, before the world changed, before we were forced to change with it. The world has changed so much since we graduated, but some things don’t change. Our class was together through many highs and lows, including losing one of our own. That memory, I don’t believe, is lost on anyone. Through bad hair cuts and braces, through classroom pranks and playground fights, through cliques and caddy behavior, best friends, 2-week “relationships,” puppy love, crushes, and heart break. Through first kisses, messy hook ups and bad rumors. Through class trips, Bar- and Bat-Mitzvahs, birthdays, prom and spring break. Through secret languages, parties in the woods, driving lessons and car pools. We grew together at times, and sometimes we grew apart. But in the end, there is a true sense of family, of shared experience. A familiarity rushes over you and the fear of awkwardness dissipates. With these people who knew you before you even knew yourself, there is a comfort. In a way, it is these people that bring you home. Ten years later, we are all grown up. We are all on our own paths in our lives, but our roots remain the same. And to remain true to who you are, you can’t forget where you came from, or the people who impacted you along the way. Here’s to another ten years Class of 2001! I’ll see you when we get there.